A Darwen-based soft furnishings company has handed over a bumper cheque to East Lancashire Hospice. 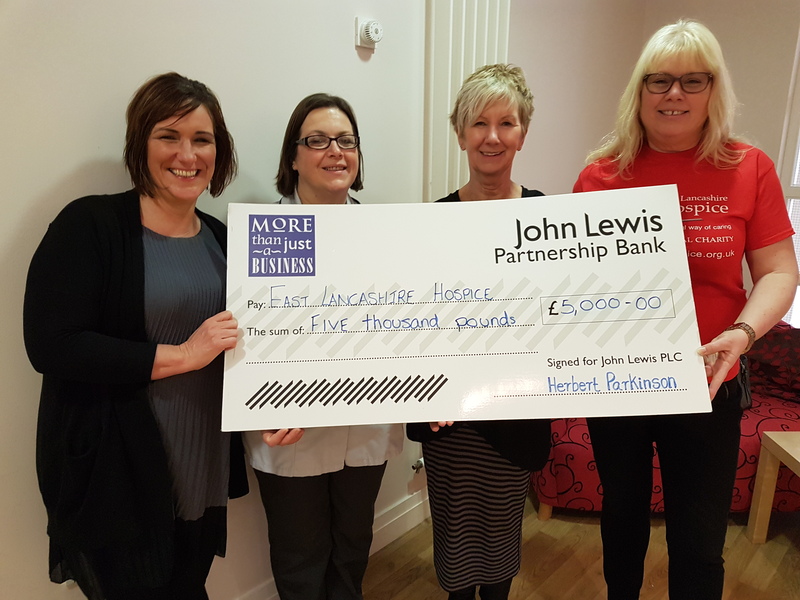 Herbert Parkinson, which is owned by the John Lewis Partnership, chose East Lancashire Hospice as their charity of the year for 2016. The incredible donation of £5,000 has been raised by the staff through a number of events. Fundraising has included a sponsored slim, employees taking part in the annual 10K pub walk, knitting and selling miniature Christmas puddings, a Christmas raffle as well as donating Easter eggs, and donating 'seconds' curtains and cushions to the East Lancashire Hospice shops. Gillian Walsh, Community Liason Co-ordinator at Herbert Parkinson,said: "We unanimously voted to support East Lancashire Hospice as our local charity of the year. "We have enjoyed hosting and running a number of different fundraising events for the hospice and we would like to thank all of our partners for getting involved." Denise Gee, fundraiser at the hospice, thanked the firm for its support. She said: "Without the backing of companies like Herbert Parkinson we would not be able to provide outstanding care to patients in Blackburn, Darwen, Hyndburn and the Ribble Valley. "We would like to sincerely thank everyone at Herbert Parkinson for their support and for choosing East Lancashire Hospice."